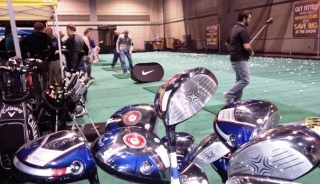 Golfers filled the Overland Park Convention Center on February 21st through the 23rd and experienced just about all golf has to offer at the Kansas City Golf Show. There was something for everyone from trying out and hitting all the latest golf equipment to instruction for adults and kids alike. “This is always a great show for us. A chance to share with the golfing public what our golf course has to offer,” said Brandon Marshall, Head Golf Professional at Ironhorse Golf Club. That sentiment was shared by other exhibitors at the show, but they weren’t the only ones singing the event’s praises. “We come just about every year and every year this show gets better,” said KC area golfer, Carl Stevens. “I’ve been trying out the new Big Bertha driver on the range and then spent some time watching the Match Play tournament over at the 19th Hole [by Michelob Ultra].” He went on to indicate that he had enjoyed a few beers as well. Throughout the show, the range was one of the more popular places, as major manufacturers were letting golfers have a go on the indoor driving range. The newest offerings from Ping, Callaway, Nike, Titleist, TaylorMade, and more were on display with experts on hand to offer advice and help golfers find, and try, the latest equipment. Meanwhile, fun of a different sort was occurring at an entire practice area dedicated to getting kids started in golf. The SNAG (Starting New at Golf) program brings a new approach to learning golf to area schools, and they had their program on display at the Kansas City Golf Show. 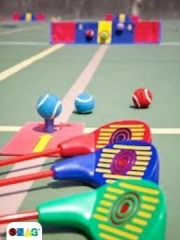 It uses oversized balls closely resembling tennis balls and oversized clubs designed to make it easy for youngsters to make contact and send a ball flying. Young golfers were getting basic, fun instruction while they hit, chipped, and putted using the special equipment. Hosted by the Midwest Section PGA, they are offering a set of summer camps this year to complement the highly successful school program. “We’ll have four levels of camps this summer, with something for all levels of junior golfers at local green grass golf facilities,” said Julie Roberts, PGA Professional and General Manager at Minor Park Golf Course. She included, “The camps are 2-day schools running 3 hours each day. We’ll have a Level 1 program which is our SNAG iNtroduction camp for kids as young as the second grade. Depending on a golfer’s level and age, we’ll also have what we call our Level 2 and Level 3 programs, as well as an Elite camp for older, advanced golfers in 8th through 12th grades.” For more information on any Midwest PGA program for kids, visit their website. For folks planning a golf trip or just planning their local golfing for the year, the choices were endless. Local courses were on hand to share their programs, pricing, and new information, while numerous golf resorts and destinations including those from the Lake of the Ozarks area and other destinations. Brent Deems, Assistant Golf Professional at The Preserve at Rathbun Lake, had traveled from his popular destination to share what his golf course had to offer in conjunction with the Honey Creek Resort. 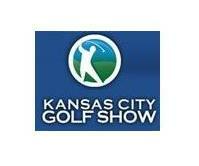 “We get a lot of golfers from the Kansas City area, mostly through our association with the golf show here,” he said, indicating they have been an exhibitor since 2009. Their resort, and the rest of Rathbun Lake and all it has to offer, is a mere 185 miles away from Kansas City in south-central Iowa. Some of the local golfers hanging around the booth shared that its a great course that has something for everyone and no difficult forced carries. With multiple tees, it stretches from 5254 yards for shorter hitters, all the way to 6987 yards for long hitters. Speaking of long hitters, many of the area’s self-described big hitters were huddled around the Robertson Entertainment booth and their TruGolf Simulator. Throughout the day, they were hosting long drive contests and closest-to-the-pin competitions, with winners taking away bragging rights and free rounds of golf. When we were there, 336 yards was what it took to win one such contest, with several other contestants reaching the 300 yard mark. The closest-to-the-pin offered appeal as well. Playing to 153 yards, it took a shot to 5 foot range to expect a chance at winning. There were multiple contests each day and golfers could enter as many times as they liked to hand over the cost of entry, so even if you didn’t get your best swing on the ball during one contest, you could try again. Kim Robertson ran the competitions and shared a bit about her company. 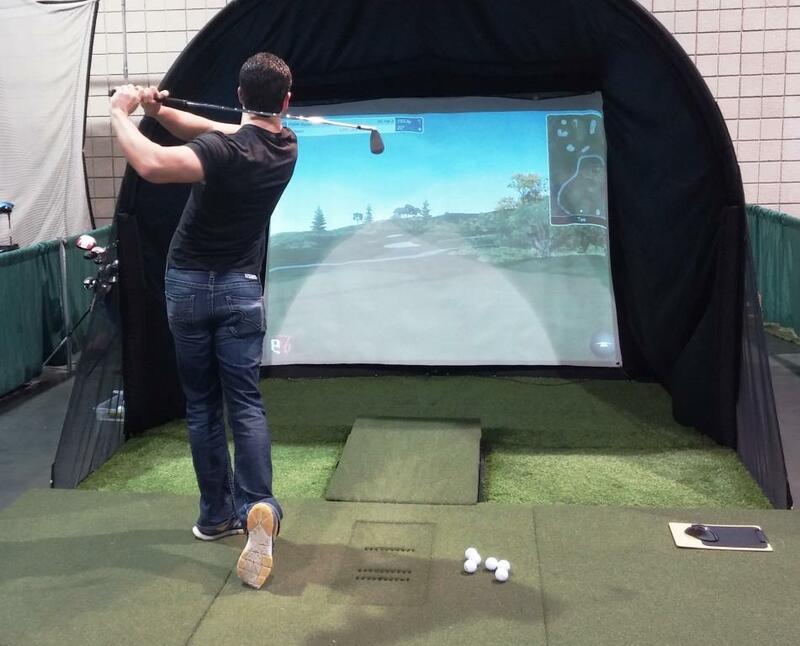 They sell and rent indoor golf simulators to individuals wanting the ultimate man cave or for corporate events and golf course sponsored winter competitions. “Before getting into this business, we tried all the simulators on the market looking to find which offered the best combination of accuracy and fun, ” she said, “and we landed on TruGolf.” Golfers interested in a simulator for personal use or for rental for an event, can contact them through their website, www.indoorgolfkc.com. Besides the competition at the Robertson Entertainment Booth, golfers were competing at a long putt contest and other fun, but very competitive, competitions. Finally, the golf show had a lot of options to buy new golf equipment, games, training aids, and more — even a new golf cart! 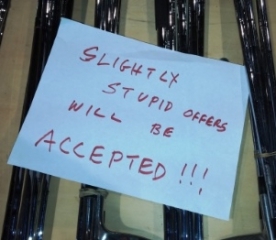 Edwin Watts had an expansive on site golf shop with show discounts and deals on everything from clubs to apparel. Some discounters and re-sellers were on hand and apparently, any offers were welcome.